Game 1: Final Fantasy VI lived up to its billing as a #1 seed, albeit by a slim margin, as it took down its fellow 16 bit foe by two votes. Game 2: It was deja vu in the Raccoon City region, as a classic Squaresoft RPG defeated an entry in Capcom's Blue Bomber franchise by a score of 10 to 8. 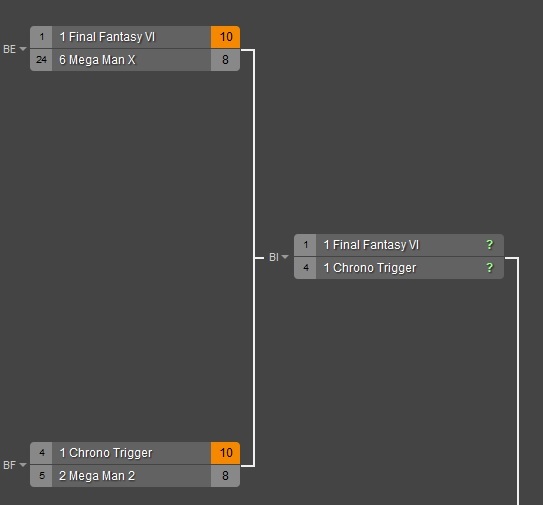 This time it was Chrono Trigger prevailing over Mega Man 2, knocking the final NES original out of the field. Game 3: The third time was a charm for Capcom, as Resident Evil 4, originally found on the Gamecube, beat out Castlevania: Dawn of Sorrow fairly handily. It was a good run, but no handheld original titles remain in the field. 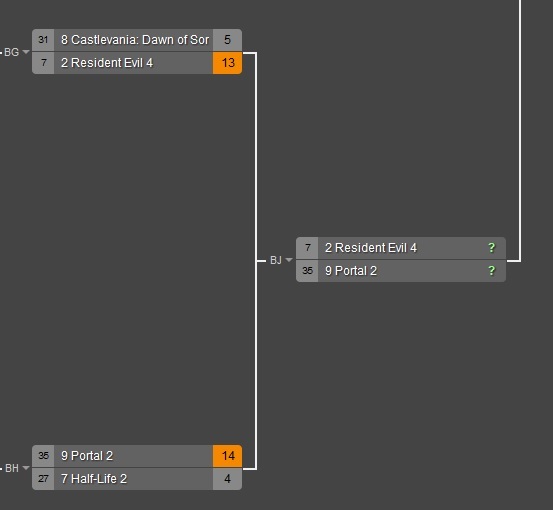 Game 4: In the non-Nintendo region, two games utilizing the same engine went head to head and the newer of Valve's entries made it through, despite being the lowest seed remaining in the tournament. No matter what the outcome of the Final Four matchups, It will be 3D vs. 2D in the finals. I was hoping for at least one of the Mega Man games to make it through (and really hoping for both to make it through), but it looks like they got edged out. Boo. At least they put up a good fight.